Last year, the Old Paths Quartet created a stir in the Southern Gospel blogosphere with Right Now, their first album on the Crossroads Record label. After listening and liking what they heard, fans became anxious for a second release, to see whether the Old Paths could produce another great album, or whether the subsequent effort would be a "sophomore slump." Judging from the positive comments around the blogging world, I’d say These Truths is anything but a failure and that the Old Paths delivered exactly what their fans were hoping for. This album has something for everyone. For those who like traditional quartet singing, there’s plenty of songs to choose from. And there’s even a couple mildly progressive numbers to satisfy those who prefer a more modern style. Jeremy Peace is the group’s talented tenor singer. Fans who have been listening for a while will remember songs such as "He Chose the Tree" and "I of the Storm" where Peace’s range seemed to know no bounds. He delivers the same kind of treatment on his new song "God Said I Love You," a tender slow number that fits him well. I didn’t really care for the "note" as some are calling it--that is, the part in the song where Peace outrivals any of the traditional "high" singers in the industry--but regardless, it was quite a remarkable feat. The group’s bass singer, Daniel Ashmore, seems to be rising through the ranks of bass singers. Still in his twenties, he is proving to be quite the capable soloist. He gets the chance to shine on a cover of "God’s Gonna Do the Same," the classic made popular by the Hinsons, as well as on a more recently-penned number titled "Enough and Then Some." Douglas Roark is the group’s baritone singer, who founded the Old Paths Quartet with Wayne Rackley. He leads the song "If It Were Not For Grace," which is a slow, laidback number. Roark’s voice is reminiscent to me of Scott Howard from Legacy Five. He adds a nice, mellow touch to the song. He also leads the patriotic, mildly progressive "We Hold These Truths" which is one of my favorite upbeat songs on the album. In my review of the Old Path’s last album, Right Now, I noted that one thing I would have liked to have heard was some orchestrated songs. Well, apparently, the guys thought so too. They pulled out all the stops for the huge power ballad "Long Live the King" which some are speculating may be the greatest song they have ever sung. Whether it stands head and shoulders above their previous songs or not I can’t say, but it’s definitely a five-star track. Lead singer Wayne Rackley does a tremendous job leading the song. Although some of the other group members may get more attention, Rackley is certainly no second-rate vocalist! 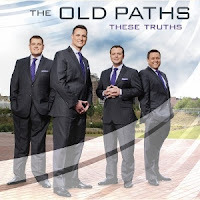 Last year I reviewed Right Now, the Old Path’s first album with Crossroads Records. I really enjoyed the song selection and the group’s sound and gave the project a 4.5/5 star rating. It took me a little longer to warm up to These Truths. But I did warm up to it. And I guess that’s what matters. Actually, my favorite of the two CDs is probably Right Now. But These Truths is just as good as it's predecessor and is certainly not a flop. The song selection is great, and vocally, the group is right on.